I recently changed my main gravatar to this one of a thrashing machine. For many people the image doesn’t mean anything. For me, it brings a lifetime of memories. What is it? 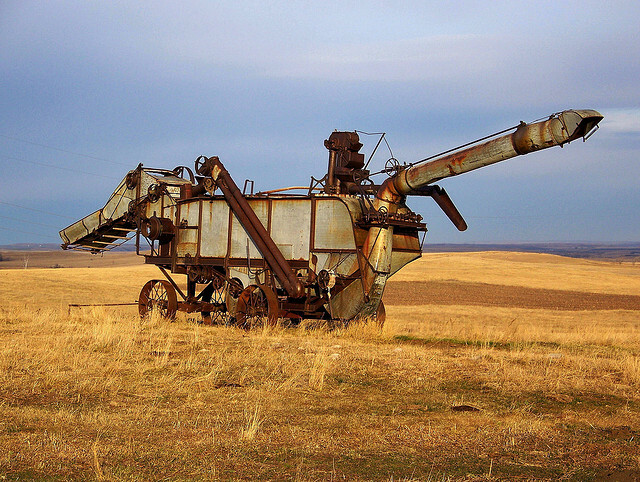 A thrasher machine for separating oats from the chaff. I grew up in northern Minnesota on a farm, where putting up hay bales and thrashing oats marked out summer work. That and cutting 30 cords of oak and maple for our wood furnace. This photo shows one very similar to what I remember in the 1950’s and 1960’s. I remember several farmers would plant oats in their fields in late spring. Then when harvest season came, they would pull the binder behind the tractor, which would cut the oats and pull them into a bundle with string wrapped around the bundle. Then they would shock their own fields of grain, that is, put a few bundles upright in teepee fashion, which allow the grain to dry. The next step was to load the bundles into a wagon for delivery to the thrashing machine. We only had one thrashing machine in the area, owned by John Goodell. So, he would pull the thrashing machine to one farm, and all the farmers (and neighborhood kids) worked together to harvest the entire field. Then he would pull the thrashing machine to the next farm, and the process continues. Usually we would have our noon meal (called “dinner” in my neck of the woods), somewhere near the thrashing machine. The women would fix the meal, bring large blankets out and spread everything under a large tree. Many good meals!! Seemed like the food tasted better, too. 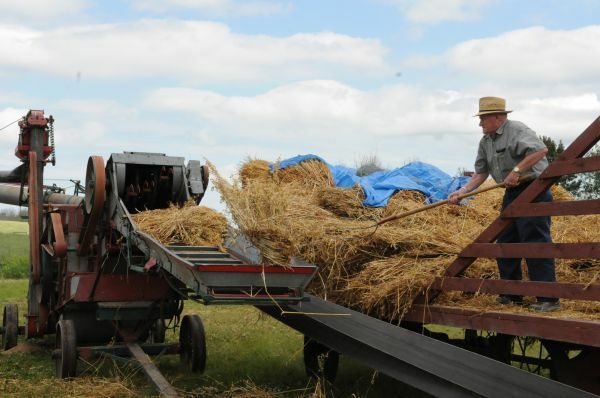 Usually the kids drove tractor and the men and high school boys would pitch the bundles onto the wagon. Then they would drive up to the thrashing machine, one wagon on each side of the delivery belt. I started driving tractor in the field when I was six (yep, 6, as in half a dozen years old). The first time I was driving a tractor and wagon for thrashing season, I was doing so up and down and sideways on hills on Vic Swan’s farm. I remember the high schooler (Rod Goodell) would give help between throwing bundles on the wagon. But on a side hill, I had to stop while he pitched the bundles. Unfortunately I couldn’t hit the brakes hard enough while pulling back on the clutch, and the tractor and 4 wheel wagon started rolling backward on the side hill. 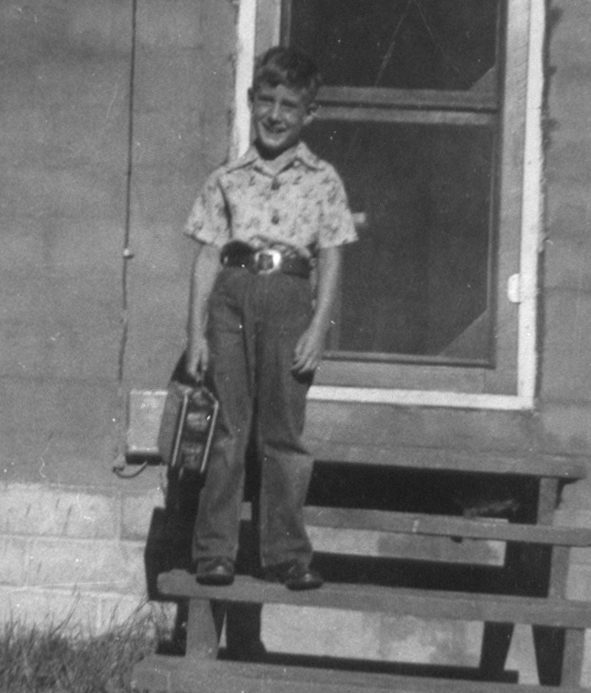 Me at six years old—driving the tractor at that age?? So Rod ran to the tractor and jumped on behind me, grabbing the steering wheel. He began swinging hard on the wheel, and in the process, his elbow came down on my nose. Broke it good, the first of four nose breaks for me. He managed to get the tractor and wagon straightened out. By then with my bloody nose, I managed to walk ½ mile back to the thrashing machine where my mother was helping with the meal. Didn’t stop me from driving, though. Next time one of the farmers was ready, so was I!! While growing up was at times hard, there were also some very enjoyable times. Thrashing season was one of my favorite times. And the gravatar reminds me of that. I grew up on a farm as well. We didn’t grow lots of grains, etc. but we did grow feed for the animals and had huge gardens. You are right about working at a young age; we were in the “garden” as soon as it was light and worked until “dinner” (around 11:30am). The “garden” consisted of about 7 acres of potatoes, 12 acres of corn, about 1 1/2 acres of green beans and tomatoes. We had smaller patches of beets, turnips, and okra. My how I hated picking off those tomato worms and potato bugs. But at the end of the day we were happy, and tired; boy did we sleep well! I don’t think a bit of hard work did any real harm for our family! Great memories too! and driving at age six?